Sunbrella and Satler are our two main fabric suppliers. 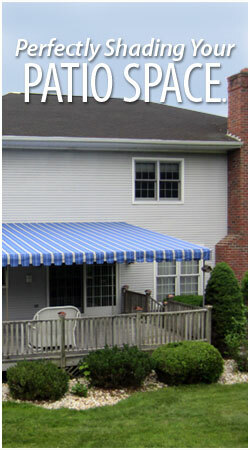 Our patio awnings come with a ten-year factory warranty. This tubing is galvanized inside and out. Our frames are custom-made to the size of your deck and we are capable of bending or forming the awning to any shape your deck or patio requires. Stationary patios can be mounted on the roof, under the soffet, or flush-mounted to your home, and the same can be done to any other product that we produce. Patio awnings are put up in April and taken down in late October. We also provide seasonal awning take down, storage, maintenance, awning cleaning, and repair so that we can help you get the maximum life out of your patio awning.